Last weekend The Brooding Architect and I went along to a pot luck dinner party hosted by our good friend, The Film Buff Lawyer. For the uninitiated a pot luck dinner is, as the name suggests, a dinner party where everyone brings a dish to add to the feast. I was absolutely blown away by the amazing food people brought along – everything from Jamaican Beef Curry to Som Tam (Green Papaya Salad). Everything was simply delicious and the company was fantastic too (no doubt enhanced by the addition of plenty of wine). Our contribution to dinner was a Rainbow Chard Pie. Rainbow chard is a particular variety of silverbeet, so if you cannot find rainbow chard simply substitute it with a bunch of silverbeet or English spinach. The filling for this Rainbow Chard Pie is based on a traditional Italian recipe for ‘Easter Pie’ found in the Italian Food Bible ‘The Silver Spoon’ – the only Italian cook book you will ever need to buy. What I like about this Rainbow Chard Pie is that it is very substantial and filling, without being too stodgy or heavy. 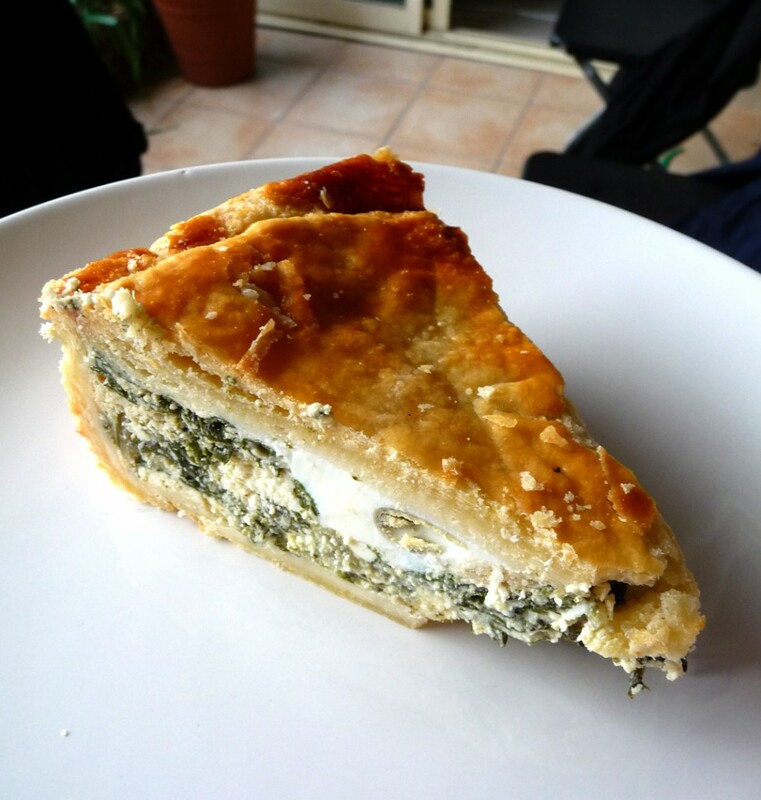 The pie can also be served hot or cold, making it perfect picnic food for the summer months. 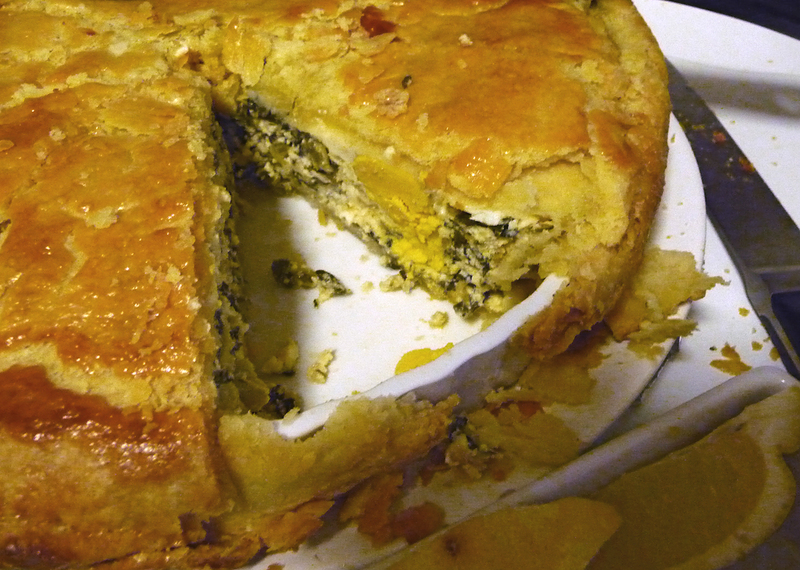 To make the Rainbow Chard Pie even more special for the pot luck dinner party, we used a buttery homemade puff pastry, which was patiently rolled out every half an hour by the Brooding Architect to ensure that the butter was evenly dispersed. Homemade puff pastry is extremely time consuming to make, but definitely adds a touch of richness and luxury to an otherwise very simple dish. The results are well worth the effort if you have the time. I have listed ready rolled puff pastry in the recipe below, as this greatly speeds up preparation time. Bring a large pot of water to the boil. Wash the rainbow chard well, ensuring that all dirt and grit is removed, remove the firm stems from the rainbow chard and cook the leaves in boiling salted water for 10 minutes. Drain well, cool and chop finely. Pre-heat oven to 200 degrees Celsius. Grease a 23cm round quiche dish (or baking dish) with 25 grams of the butter. Roll together 2 of the puff pastry sheets and line the base and sides of the prepared quiche dish with puff pastry, letting the edges overhang. Refrigerate until required. Beat together 4 of the eggs. In a separate large bowl combine the ricotta, chopped rainbow chard, pecorino, the beaten eggs, breadcrumbs, thickened cream, lemon zest, herbs, nutmeg, cayenne pepper (if using) and salt and pepper to taste. Mix well, until all ingredients are evenly combined. Pour filling into the prepared dish. Using your thumb, or the back of a spoon, make six small hollows in the the filling and crack the remaining 6 eggs into each hollow (one egg per hollow). Roll together the remaining 2 puff pastry sheets, place puff pastry over filling. Pinch together the the edges of the pastry carefully to seal. Trim any excess pastry as required. Melt remaining 25 grams of butter and brush over pastry. Cut a small slit in the centre of the pastry. Bake pie for between 50 and 60 minutes, until the puff pastry is golden brown. Once baked, allow the pie to cool for at least 10 minutes in dish before serving. The pie may be served hot or cold. Serve with a wedge of lemon on the side. I confirm, with the credibility that goes with being an attendee at the pot luck dinner, this was DELICIOUS!!! Massive tick to the Brooding Architect for his pastry rolling! I second your comments about the pie!! It was fabulous! An honorable mention must also go out to the prawn curry. Deeeelish! Thanks so much ladies – repeat performance due soon. Agreed that the prawn curry was sensational.